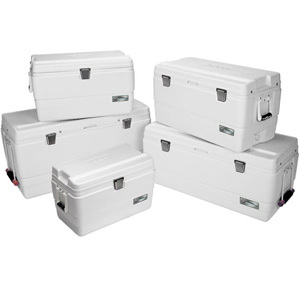 Coolers vary in size, type of construction, durability, impact resistance, ice keeping ability and in other respects, including handles, hinges, latches and in some cases, wheels for portability. There are three basic types of coolers: soft-sided, hard-shell and electric coolers, which do not require ice. We’ll talk about soft-sided coolers first. Soft-sided coolers by Igloo, YETI and A/O (American Outdoors) are good for keeping food and beverages for one or perhaps two days. Designs vary. Some consist of a hard inner liner with an insulated fabric shell—sort of a hard/soft cooler. Many are flexible inside and out, which enables them to be compressed for compact storage. Most offer features that hard-shell coolers don’t, such as padded carry straps and exterior pockets for car keys, cell phone or a GPS. They fit nicely into the crowded environment of small boats, with soft exteriors that enable them to squeeze into odd nooks and crannies along with other gear aboard. 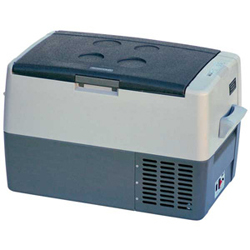 Soft-sided cooler capacity varies, from small models that only hold a couple six packs up to much larger sizes, such as the 48-quart models by A/O. Looking for a hardshell cooler with ultimate durability that can take a pounding on a heaving deck? Then consider a roto-molded cooler. These coolers can take most any amount of abuse. Click the following link for a video by YETI, staring one of their coolers and the 500-pound wrestler “Big Bald Mike”. Choices include YETI Tundras and a number of models by Igloo. All feature seamless roto-molded construction, the same as today’s whitewater kayaks. The impact resistance of these coolers is excellent and the hardware is outstanding. All boast strong, rubber T-latches and robust, self-stopping lid hinges. Most include recessed grab points, non-skid feet and handles that store out of the way. 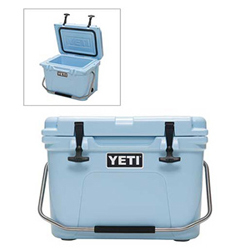 Capacities vary from easy-to-carry 20-quart models (with swing up handles) by YETI and Igloo all the way up to Engel’s Deep Blue High-Performance Cooler, with 317 quart capacity. Ultimate durability costs, but if you want one of the most “bullet proof” coolers that money can buy, one of these might be for you. Apart from roto-molded coolers, choices include Igloo’s original and highly popular Marine Elite series. The reason for their popularity is because they are a great value for the money. These coolers reflect a number of improvements that Igloo has made over the years. Gone are the plastic hinges and latches that used to break. Instead, all of them boast stainless steel hardware. Outstanding features also include comfort grip handles, stain-resistant liners with odor inhibitors, ultraviolet inhibitors that guard against sun damage and infrared technology that boosts cooler performance by keeping their surfaces cooler. Our Igloo selection includes coolers with wheels and telescoping handles in 50-, 90- and 110-quart capacities, which make it easy to cover long schleps from your car to your boat or camping spot. For many coolers, optional cushions are available to convert your cooler into a comfortable seat. Check to see if the cooler you want comes with a food storage rack. If not, check to see if one is available. If you will be keeping your cooler on deck, consider a tie-down kit and/or a set of corner chocks. According to Igloo, their Marine Elite Offshore Cold Lockers can, “under controlled circumstances”, keep ice from seven days for small models, and up to 14 days in the case of their behemoth 250 quart model. Ice Keeping Ability as stated by Igloo provides an easy way to compare the relative performance of coolers within the Offshore Cold Locker line, however the key phrase is “under controlled circumstances”, which is why YETI (with extra-thick insulation and 360° lid gaskets similar to Igloo’s) makes no claims regarding ice keeping ability. After all, can we really control exactly when the crew will want to grab a beer, or the watermelon that beckons from inside? At the end of the day, it is safe to say that coolers by YETI, Engel and Igloo can keep ice for surprisingly long periods of time. The size you select should depend upon the intended use, the number in your party, and how long you will need it. A small soft-sided or hard shell cooler is fine for a day trip on a kayak but longer outings need something bigger. How big? Cooler capacity is generally stated in quarts or capacity in 12-ounce cans. One quart equals about 0.75 cans, so a 24-quart cooler will hold about three six packs or 18 cans. Another way to gauge capacity is to divide the capacity in quarts by 30, so a 60-quart cooler equals two cubic feet. When selecting a cooler, remember that about 30-50 percent of its capacity will be taken up with ice. For three people on a day trip, a 40-quart cooler is generally fine. For the same group on a weekend camping trip, a 50- to 60-quart cooler is good. Try not to buy a cooler that is too large, as tightly packed coolers keep food colder and longer. Purchasing a jumbo sized cooler and filling the excess space with ice might seem OK, except for the expense and extra weight you will have to carry. Conversely, an excess of air or open space inside an overly large cooler makes the ice melt faster. 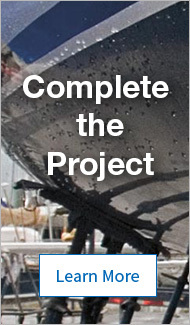 An exception to this conservative approach is offshore fishing coolers. How big are the fish you plan to catch? We can’t answer that, but we can say that most anglers would be loath to cut their trophy sized catch in half in order to bring it home! Examples of coolers commonly used for offshore fishing excursions include coolers by Igloo, Engel and YETI in the 150-250 quart class. Let’s say you and your spouse are planning a five day camping trip and are ready to pull out the stops and purchase the YETI Tundra 110. But consider this: A 100 quart cooler fully loaded with food, drinks and ice can weigh up to 200 pounds—so unless you are bulking up for a body building event, purchase two smaller coolers—one for drinks and one for food. You will be opening the drink cooler a lot more often than the food cooler which means that the ice in the food cooler will melt slower and that the food will keep longer. There are two main types of electric coolers which operate on 12V DC current supplied by your boat or vehicle’s cigarette lighter: compressor driven and thermo-electric. Thermoelectric coolers rely upon an electronic phenomena known as the “Peltier effect” to either heat or cool their contents. The advantage to these coolers is that in addition to not having to deal with slushy ice and wet food items, available space for food storage is increased due to the absence of ice, which in a conventional cooler takes up a large percentage of available space. The disadvantage is that cooling capacity is limited by the ambient temperature, which means a thermo-electric cooler rated to cool 40°F below ambient temperature will on a 90°F day only cool the contents down to about 50°F. Compressor-driven coolers use a refrigerant along with a compressor and an evaporator—just like a household refrigerator—which gives them the ability to cool, and/or freeze their contents. Unlike thermoelectric coolers, compressor-driven coolers can hold a steady temperature regardless of the temperature outside. If you are considering a compressor driven cooler, check out the models we offer by Norcold, Dometic and Engel USA. 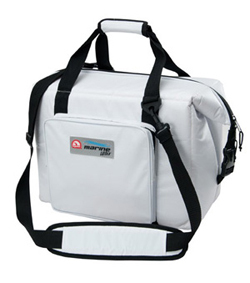 Select a cooler according to how much food you need to store and the purpose of your trip. Soft-shell coolers are convenient for short outings, but don’t expect them to keep ice like a hard shell cooler can. Don’t buy a cooler that will be too heavy to carry and if you need the extra capacity, consider purchasing two—one for food and one for drinks. Hard shell coolers such as Igloo’s Original Marine Elite series offer great bang for the buck. For ultimate durability, roto-molded coolers are best. Offshore anglers think big!